As polls closed on Tuesday, Georgia’s Republican Party members and Brian Kemp supporters flooded the ballroom of The Classic Center in the gubernatorial candidate’s hometown of Athens. Those assembled included Kemp’s family and friends, senators and congressmen, students, a man carrying a “Latino’s for Kemp sign” and a Santa Claus impersonator, among others. 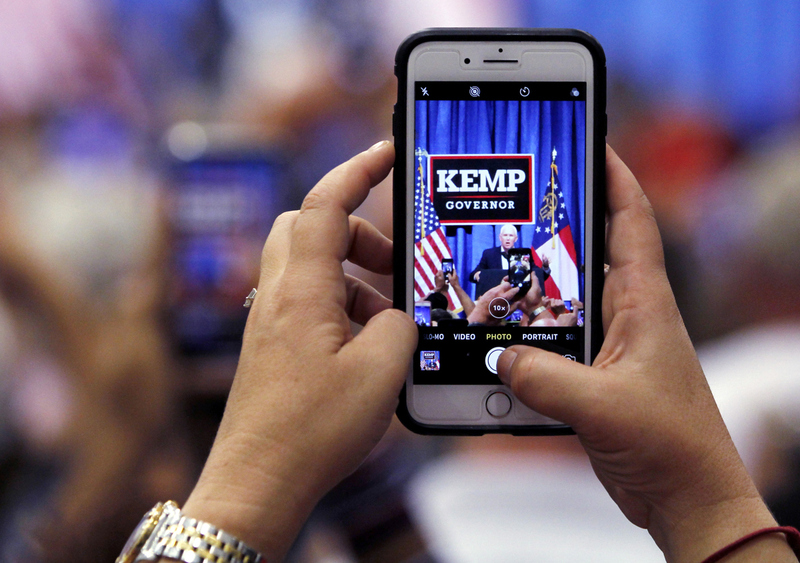 Each felt confident that Kemp would be named the next governor of Georgia by the end of the night. “I am not opposed to different approaches to things. But I think at the moment, the other approach is just a little bit too radical of a change at one time,” said Daun Griffin, who drove from Monroe to attend the event. Griffin says she is a family friend of Kemp’s and has known him since he was 14-years-old. “I am optimistic. A little prayerful as well, but I am optimistic,” she said. “I believe Brian stands for represents what the values are historically for Georgia,” Griffin said. While Griffin felt a little prayer may be needed for Kemp to secure a win, others like Mike Pos were had few doubts. 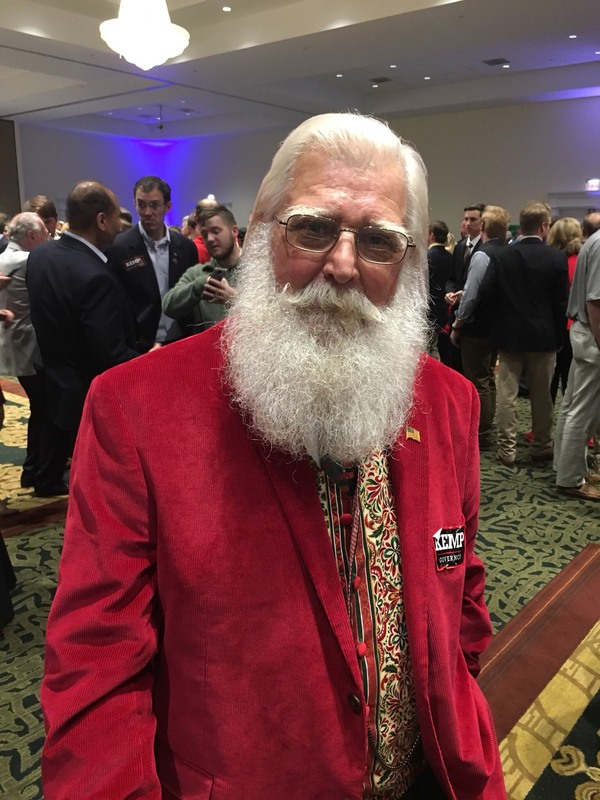 Pos, a Santa Claus impersonator from Lavonia, wore a bright red suit and a long with a pair of similarly colored “Kemp for Governor” stickers. He said he didn’t usually get involved with political events but felt the need to come out and show support after meeting Kemp several times on the campaign trail. Mike Poss anticipates a Kemp victory. Photo by Sam Jones. Representing a younger demographic was Joel Pollack from Alpharetta, who wore a scarf that read “GOP United.” Pollack said the play on the soccer team, Atlanta United, represented the Georgia Republican Party’s united effort to hand Kemp the governorship. Pollack, a senior business major at Valdosta State, campaigned for Kemp and is the acting Executive Director for the Georgia Young Republicans. He decided to campaign for Kemp because of his belief that Democratic nominee Stacey Abrams wasn’t prepared for the job. Meanwhile, Steven Williamson, dressed in snakeskin boots and a tall cowboy hat, stood in the corner taking the scene in. “I feel like that Georgia is going to step up just like America did with Trump,” he said. “I just feel like America is going to step up again,” Williamson said. People like Williamson and Griffin represent just a small sample of the crowd that filled the large ballroom at The Classic Center, half mingling and half paying close attention to election returns, as speakers such as Senator David Perdue and current Governor Nathan Deal predicted a sweeping victory for the Georgia Republican Party. They’ll know shortly how accurate those predictions are. Sam Jones is a graduate student studying journalism.